Hello! I’m Gregory Naigles, and welcome to my website. 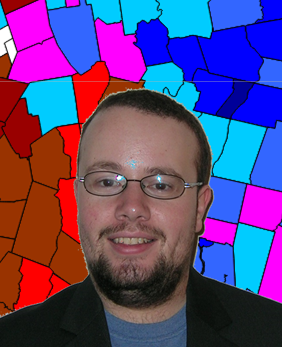 I am a geography whiz, political data expert, and mapping guru who has collected, analyzed, and mapped election results from all fifty states for over seven years. In this website are examples of my work, some of which has been published in peer-reviewed journals. My education and research experience have given me strong data analysis skills and the ability to manipulate large amounts of information in programs such as QGIS, ArcMap, and R.
I have posted many of my maps on this website, and I encourage you to take a look! I grew up in Tolland, CT, and I am a 2015 graduate of Colby College in Waterville, ME with a B.A. in Government. I now live in Concord, New Hampshire. In my free time, I enjoy hiking and creating fantasy redistricting maps. I can be contacted at ghnaigles -at- gmail -dot- com.